Lining: Cambrelle / Sympatex WATERPROOF Barrier. Blood Borne Pathogen Compliant. Special Features: Two Row Padded Leather Top. Shaft Vapor Exhaust Vents. 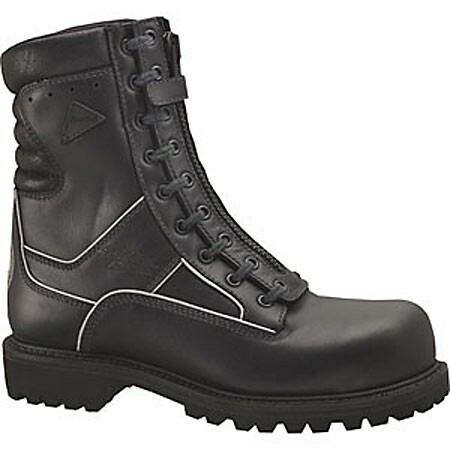 This footwear meets the requirements of NFPA 1999, Standard on Protective clothing for Emergency Medical Operations, 2008 Edition. This wildland fire fighting protective footwear meets the requirements of NFPA 1977, Standard on Protective Clothing and Equipment for Wildland Fire Fighting, 2005 Edition. Electrical Hazard. Tested For and Meets CAN/CSA/Z195 18,000 Volts Electric Shock Resistance Standard. 3M Scotchlite Reflective Material - High Visibility Piping.